In previous blog entries I have said that I liked the trend in the designs of new coins. I have said that I disagreed with others that we should not go back to depictions of Liberty on our coinage. While I will agree that some designs in the 50 State Quarters program are not very artistic, some are phenomenal like the Charter Oak of Connecticut. But it is an exciting program and I cannot wait to see this year’s coins. Having read interviews with artists and engravers, and meeting Joe Fitzgerald, I understand how difficult it is to design and execute the design on a piece of metal that fits in the palm of a hand. I do not know if I can do better, but I would assume a professional engraver working for the Mint would understand how to just “get it right.” Unfortunately, the engraver who did the Benjamin Franklin “The Founding Father” commemorative did not do a good job. The engraver is not identified on the Mint’s website. With all due respect, the portrait depicts an old man and not the strength and wisdom of a gentleman of Franklin’s stature. According to the Mint’s website, the “image is based on a bust originally executed by French sculptor Jean-Antoine Houdon in 1778.” If we look at the bust by Houdon and the coin side-by-side, the coin has Franklin’s neck looking like he has a goiter and his eyes are wrinkled and tired looking. 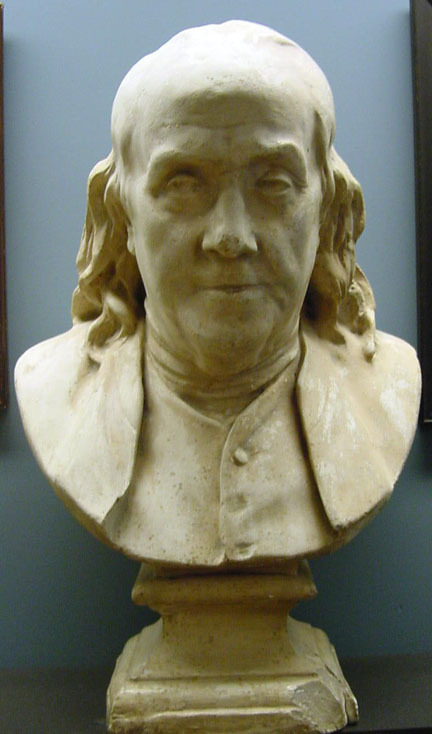 Houdon’s bust shows a stronger face of an older gentleman without Franklin’s neck having to held in by his collar and strong eyes without the wrinkles that appear on the coin. 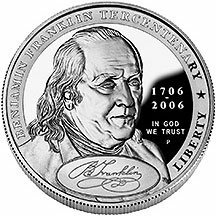 Even if you take perspective and lighting into consideration, the coin shows Franklin’s neck out of proportion. The result is that the image does not seem to properly represent the man the coin commemorates. If there was a problem executing this coin, the Mint could have use the design of the Franklin Half Dollar by John R. Sinnock. That design was less wrinkled and better executes the bust by Houdon. I am sorry the Mint did such a bad job with this coin. I hope they do better in the future!